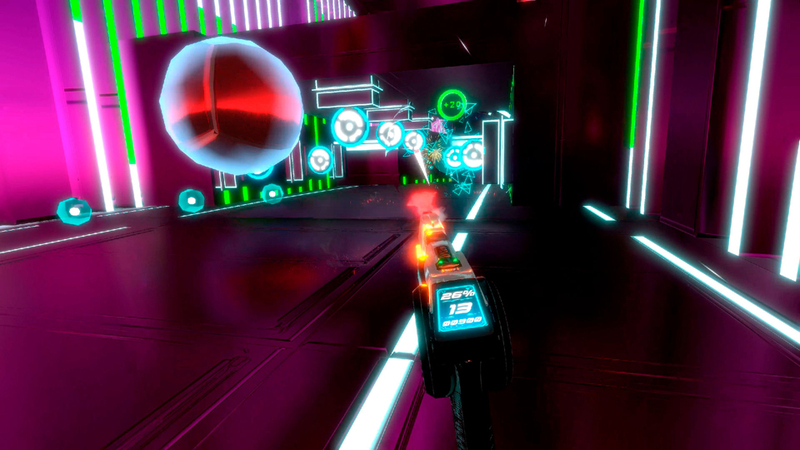 Despite what the name says, this is not a rhythm-based shooter…well at least not a shooter centered around making beats to the tune of your own blaster. Beat Blaster is actually a mix of a runner-type, obstacle course and shooter all rolled into one, utilizing some intuitive movement mechanics through 30 levels of non-stop action with your goal being to get to the end and maybe get a top score while doing it. Blast stuff to a sick beat! Controls are handled in a few different way’s dependant upon your own preference and the control method used. DS4 and Aim control almost identically save for the option on the Ds4 to dual wield, which let’s you shoot each gun with the left or right triggers. With either the Ds4 or the Aim you can use the thumbsticks to move forward and to the sides, there is no going backwards in this game, though I found this method of control to be a little to finicky as head movements are still detected by the game. 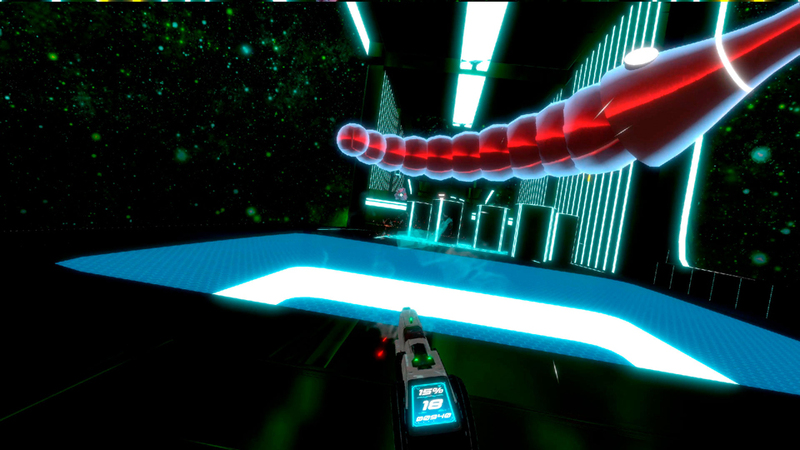 The intended way to play Beat Blaster is to Move your head slightly toward or away from the camera to move faster or slower and while it may seem initially awkward to do this, it becomes second nature after only a few rounds. The moves allow you to dual-wield and are probably the easiest way to get max points. The game pushes you to get through each course as quickly as you can while avoiding all the obstacles placed in your way while collecting floating orbs and shooting targets for maximum points. Each level gets steadily more difficult with all manor of obstacles tossed in front of you making for a very challenging game. Beat Blasters looks good, though opts for a more simplistic style similar games like Battlezone or Holoball with Neon glowing objects and a very retro feel. Armed with your blaster, you continually move forward blasting drones, targets, and other enemies while avoiding moving walls, traps, shots from said enemies and other random obstacles. Where the beats come into play is not in any of your actions, but rather the levels and obstacles themselves, whom all react to the beat of the music. 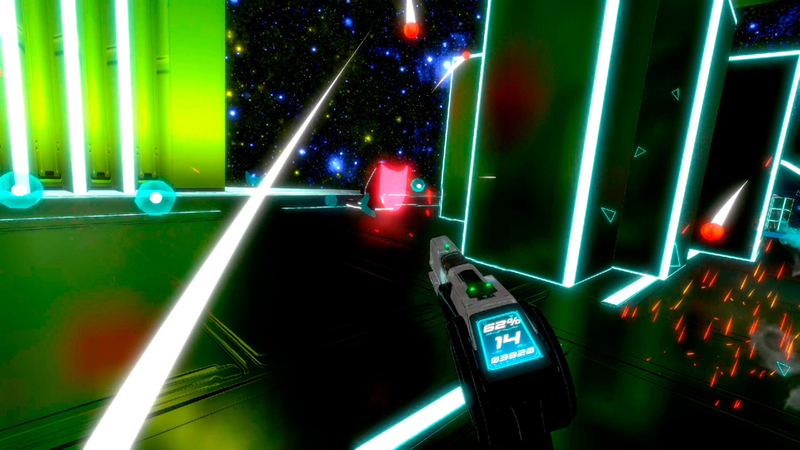 As the bass pops, turrets will rotate, or walls will display glowing lights that bounce to the music giving everything you do a sort of groove as you traverse these stages. As you progress new obstacles present themselves keeping you on your toes and adding to the overall visual package. As far as the audio goes, I really dug the soundtrack, and while each stage has its own song, some of them I couldn’t tell apart. All the songs are upbeat electronic jams that fit wonderfully with the action and thanks to the fact that the stages all react to the music, every song fits seamlessly into the game. Your blaster makes little ‘pew, pew’ noises and as you perform quick kills and reach each levels checkpoints, a familiar Ivanovich games used voice pop’s in stating random lines about how awesome you are doing. There is some really trippy stuff to avoid! Beat Blaster strength is its biggest weakness with the game being incredibly addictive but so damn frustrating when you fail. With absolutely minimal loading times, you are back in the game within a second or 2 after death with each stage only taking maybe a minute or 2 to get through…if you can get through it. Speed is key and the game punishes you for going too slow by killing you if you don’t reach a checkpoint within a certain time. As obstacles begin to stack against you it can be maddening when you fail, and you cannot play the next stage until you have beaten the current one. I encountered a few cheap deaths, but for the most part, dying is on you and you need to get better to succeed. 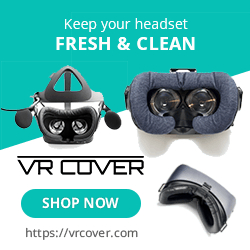 Each stage has online leaderboards so you can see where you stack up with others and while the game is a little repetitious, it draws you back in for just one more round, similar to games like Verti-go Home or Thumper. If you love those games or others of it’s ilk, the addition of shooting and some fun motion controls makes this feel unique in the ‘runner’ genre. The gun play is solid, the game looks good, sounds great and its addictive. Hard to ask for more from a game of this type. What would I pay? For all the praise I’m throwing its way, Beat Blaster does feel a tad over-priced. The content is there to justify the cost, but the repetitious nature of the game still makes it feel like a smaller experience. You’ll have fun with this for sure, but I would love to see this knocked down to the $10 to $15 range. Ivanovich Games provided The Grid with a press code for this title and, regardless of this review, we thank them for that!